Just like this we did a Demonoid Invitation code giveaway back in 2011 which is before it went offline in 2012 and just recently it came back online. Back in 2011 we received a huge response to the giveaway but that time we were not able to giveaway the amount of invitation codes that were requested, as the amount of invitation codes is limited and also we needed to do manual confirmation of the actions performed by the readers. Many of the readers were left without any invitation codes, even though they completed the actions requested, as such I was feeling bit guilty as I was not able to complete my promise to give all the readers the invitation codes they requested. As a solution to the mayhem of the last giveaway, this time we have used Gleam, to do confirmation and immediately giveaway the invitation codes, when you perform the actions, instead of manual interactions everything is automated so that everyone can immediately get their invitation codes. Just copy that invitation code and visit over to Demonoid Registration page and paste the Invitation code in the invitation code field. Please note that there is a limited number of invitation codes so once they are all over the giveaway will be stopped for a short period until we acquire new invitation codes to giveaway. If you face any problem you can contact me by using the comments form below and I will try my utmost best to solve it. 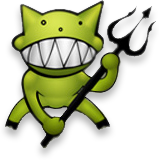 Update : Demonoid now does not require Invitation code to sign up.